Caught the audio review and interview with Marcelle Bienvenue on NPR public radio yesterday on the show All Things Considered and immediately wanted to make sure that the interview and book get plugged for this noteworthy reminder of how important food is to New Orleans and Louisiana communities. I had the pleasure of working with Marcelle for a few years in a support role while working at Emeril’s Homebase, LLC in New Orleans, she was a culinary writer and contributor for many of Emeril’s books and web content, I was an IT tech and on occasion I got to help her with technical PC issues both at work and home. It was refreshing to hear her voice again as I recalled my own endeavor to document the rich culinary heritage from our family and my 21 years of restaurant experience. 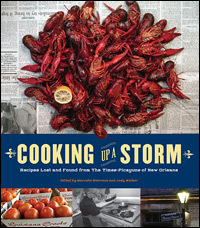 The book is the result of a response to the post-Katrina community pulling together lost recipes through the New Orleans Times-Picayune newspaper food section entitled “Exchange Alley” where folks traded lost and found recipes. Exchange Alley is a short one block street in the French Quarter on the side of the Saint Louis Cathedral which is directly across from Jackson Square. I have not read the cookbook but it should be a great resource of recipes and stories about food and cooking in and around southeast Louisiana, some of the recipes go as far back as the 1950’s such as gumbos, etouffees, and other Cajun and Creole preparations. I am looking forward to obtaining a copy of this refreshing reminder that some good can always come out of a bad situation.